Hallowe'en for me is a time when the blood quickens and the senses become more alive, as the temperatures drop and the darkness envelops us. I occasionally mention here how I like to picture the past, and I often wonder what it was like to try and survive before this age of convenience and luxury. I imagine there was fear in the darker months of autumn. Ahead lay winter, with biting cold, food that might not last until spring and a chance of sickness and death. No wonder then that as people faced this they turned to superstition and magic. It is said that at Hallowe'en the souls of the departed and the beings from other worlds may cross more easily into our world. The true origins of our modern festival have been lost in the mists of time, but the traditions we now have are doubtless directly descended from ancient folklore. Feasting and bonfires to mark the end of the harvest, sacrificial offerings and homage to the dead. I prefer a more natural Hallowe'en than the orange Chinese plastic one sold to us by giant supermarkets. I like to walk in the countryside as the sun sets, always sinking faster than I expect, always with that feeling that maybe I won't reach the safety of hearth and home before darkness claims me. 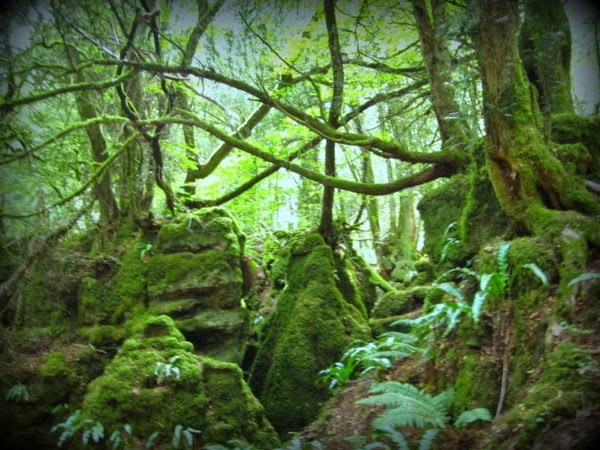 These are shots of Puzzlewood, a strange and atmospheric wood not far from here. The paths are sunken below the ground, so that you have to look up at the tree roots. It is said to have inspired Tolkien in his creation of Middle Earth, and programmes such as Merlin and Dr Who are filmed here. It is a unique and oddly unsettling place. The light is low beneath the trees, down in the ditches where slippery tracks run between huge rocky outcrops. The stone is covered with moss and ferns. A witch lives in a cave deep in the heart of the wood. I imagine she is the sort of person you would visit in the desperate darkness of winter when you had nowhere else to turn. The colours of the witch's world are where I look for Hallowe'en. The fathomless black of the stone shadow, the mossy greens of damp forest foliage, the chestnut brown of fallen leaves and acorns, the neutral beiges of toadstools, the occasional flash of a red berry or fly agaric. Ingredients for potions to lift curses and cure ills. When you consider the bleakness and danger of ancient winters, you can understand why people were happy to believe in the power of a witch. In a time before supermarkets and hospitals, when it was just you and those you love, alone in the darkness, when hunger and sickness could finish you, how could you not believe in magic? Lovely post and very atmospheric photos of the holloway. Would love to visit, it looks so beautiful. Hi CJ, I can see that in years gone by you would be glad to focus on one night being particularly spooky...then hopefully move on. 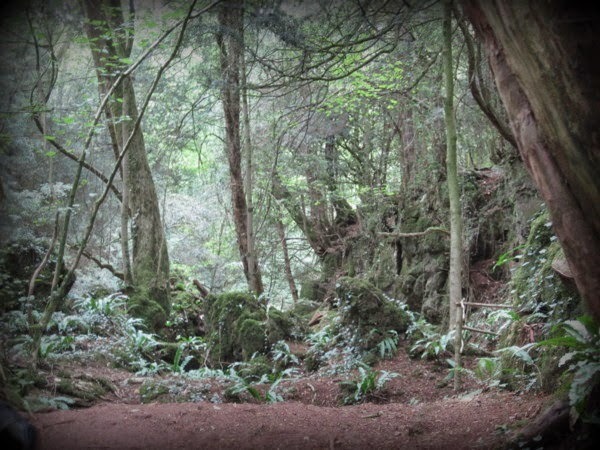 Puzzlewood looks like a great place to visit if you want to feel a bit spooked! Such an atmospheric place, the ideal location for Halloween. I can understand why it's inspired authors and why it's used for filming. Very atmospheric photos. Just noticed Chickpea used the same word so you have captured the mood impressively. Love this take on Halloween! It certainly evokes a very spooky halloween feel and you could certainly imagine a witch appearing around the corner at any moment. Ooh I have goosebumps CJ ! Such a beautifully atmospheric post. oh, i'm most definitely a believer...what an enchanting place! What a spooky, but beautiful place to walk. Oh CJ that wood! And your words! Have you read the Outcast series ifof books by Michelle Paver? You and your boys would love them. This post is so beautifully written, CJ. I really like the way you explored the more spectral side of the holiday. Here, we don't tend to look at it that way so it was very interesting to me. I hope you enjoy the day. What a wonderful imagination of this time of year. Thanks for the beautiful photos--indeed a place for Halloween spooks! Puzzlewood looks stunning! Would love to visit and get lost there. Exposed tree roots and moss covered stone are so enchanting. Awesome name for a place too! Given that specialist knowledge of healing herbs and the like was so hard to come by long ago and was only passed on to a privileged few, I think we can only begin to imagine how magical a 'witch's' healing potions must have seemed. I wonder if we are even capable of that kind of wonder in our information age. I really enjoyed this post. My boys are still very young, and we live way out of town with no neighbours. I worry that I'm somehow depriving them by not dressing them up and parading them around to collect candy. It's nice to be reminded that that wasn't always what this time was about. 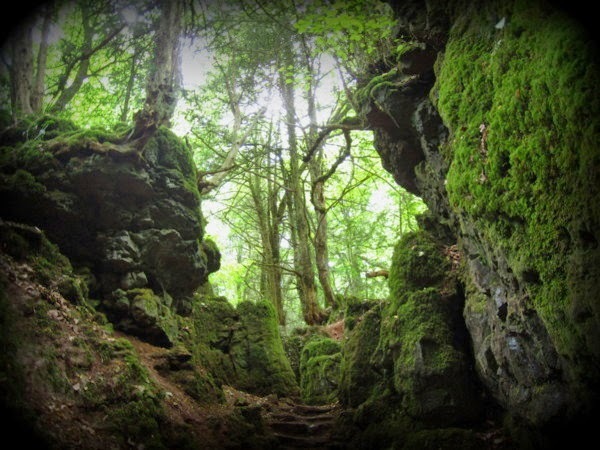 Your photos of Puzzlewood are beautiful, looks like a place I'd love to explore! We visited Puzzlewood (twice) over the years and my boys LOVED it. In summer it was more magical and mysterious than spooky though, fortunately. We try to bypass Halloween (hard though it is) since I hate how it absolutely terrifies my youngest, and seems only to be about eating as many sweets as possible. The fun has gone out of it (here anyway). I love your pictures!! Than it was called magic, now it's called sience..........I think the witches, wizzards, shaman and druids knew exactly wat they were doing. Nowadays I sometimes doubt that. Even the name of the wood is brilliant, and fitting. Love the photos the first is my favourite, the colours are magical. Oh, love it CJ! Great spooky description and really cool photos! I'm joining you in the ban on an orange plastic Chinese Halloween! I can see why you'd find that place unsettling. So many potential hiding places for little watchers! You've got me thinking about the past and about natural magic. I've always had a bit of an interest in Paganism and natural medicines - maybe it's time to do a bit more reading. I can see why so many TV programmes are filmed there. Very atmospheric. Great post - and I agree about the supermarket plastic, we tried to avoid it as much as possible. What a beatuiful, magical and slightly spooky place. Wonderful!